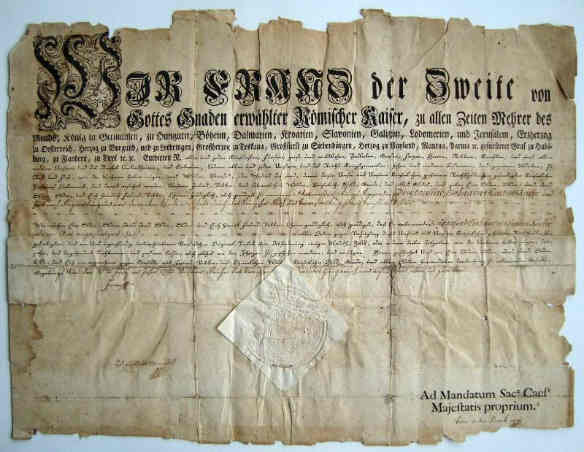 is very very rare, large (40 x 53 cm / 15.75 x – 20.87 inch) and was issued at the Reichshof in Vienna for a trip from Vienna to Regensburg. The pass includes beautiful font graphic and also a large paper seal with diameter of 12 cm! Particularly interesting is the signature on the bottom left of Franz de Paula Gundaker von Colloredo-Mannsfeld (born May 28, 1731 in Vienna, † October 27, 1807 ibid) was the last imperial vice-chancellor of the Holy Roman Empire. was a mulch-ethnic complex of territories in central Europe that developed during the Middle Ages and continued until its dissolution in 1806. The core and largest territory of the empire was the Kingdom of Germany, though it included at times the Kingdom of Italy, the Kingdom of Bohemia, and the Kingdom of Burgundy, as well as numerous other territories. The empire grew out of East Francia, a primary division of the Frankish Empire. On Christmas Day 800, Pope Leo III crowned the Frankish king Charlemagne as Emperor, reviving the title in Western Europe after more than three centuries. After Charlemagne died, the title passed in a desultory manner during the decline and fragmentation of the Carolingian dynasty, eventually falling into disuse by 924. The title was revived in 962 when Otto I was crowned emperor, fashioning himself as the successor of Charlemagne and beginning a continuous existence of the empire for over eight centuries. Some historians refer to the coronation of Charlemagne as the origin of the empire, while others prefer the coronation of Otto I as its beginning. Scholars generally concur, however, in relating an evolution of the institutions and principles comprising the empire, describing a gradual assumption of the imperial title and role. The precise term Holy Roman Empire was not used until the 13th century, but the concept of translatio imperii (“transfer of rule”) was fundamental to the prestige of the emperor, the notion that he held supreme power inherited from the emperors of Rome. The office of Holy Roman Emperor was traditionally elective, although frequently controlled by dynasties. The German prince-electors, the highest ranking noblemen of the empire, usually elected one of their peers as “King of the Romans”, and he would later be crowned emperor by the Pope; the tradition of papal coronations was discontinued in the 16th century. The empire never achieved the extent of political unification formed in France, evolving instead into a decentralized, limited elective monarchy composed of hundreds of sub-units, principalities, duchies, counties, Free Imperial Cities, and other domains. The power of the emperor was limited, and while the various princes, lords, and kings of the empire were vassals and subjects who owed the emperor their allegiance, they also possessed an extent of privileges that gave them de facto sovereignty within their territories. Emperor Francis II dissolved the empire in August 1806 after its defeat by Napoleon at the Battle of Austerlitz. (born May 28, 1731 in Vienna, † October 27, 1807 ibid) was the last imperial vice-chancellor of the Holy Roman Empire. His father was the Vice Chancellor Rudolph Joseph von Colloredo-Waldsee. 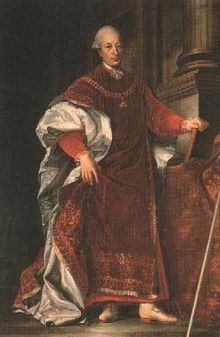 One of his brothers was the Archbishop of Salzburg, Hieronymus Colloredo. He married in 1771 Maria Isabella, the daughter of Prince Heinrich Franz Mannsfeld and Fondi and granddaughter of Heinrich Franz von Mannsfeld. As this had no male offspring, it came after his death to name and coat of arms union. His second wife married Prince Colloredo–Mannsfeld 1797 Maria Josepha of Schrattenbach, the widow of Count Guidobald Ditrichstein and of Count Johann Joseph von Khevenhüller-Metsch. From his first marriage came three sons and two daughters. Among his sons were among the Field-Marshal Lieutenant Hieronymus von Colloredo-Mannsfeld and the diplomat and politician Ferdinand Colloredo–Mannsfeld. Passbrief 1793. A most rare and historic important travel document which every museum would be happy to display!